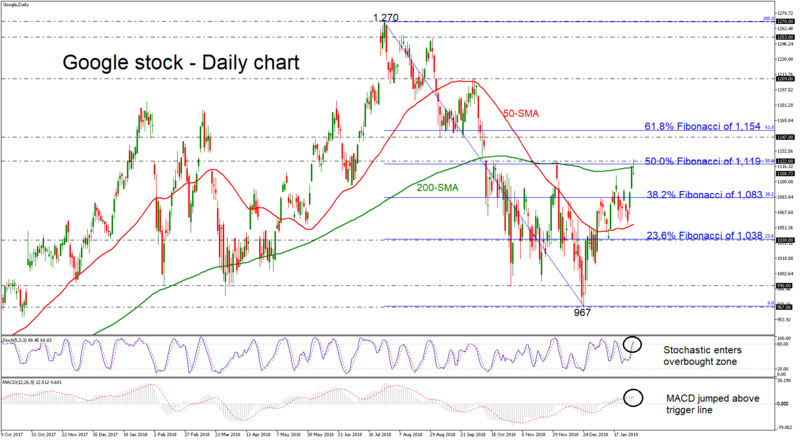 Google stock price has been finding a strong resistance level around the 200-day simple moving average (SMA) since Thursday, challenging the 50.0% Fibonacci retracement level of the downward movement from 1270 to 967, near 1119 as well. The upward spike sent prices towards a new three-month high of 1,124 and momentum indicators now suggest that the market sentiment might rise even higher as the stochastic lies in overbought area and the MACD surpassed the trigger line. Should bullish dynamics dominate, the market might revisit the 1,147 resistance in case of a jump above 1,122. Slightly above this region, the 61.8% Fibonacci of 1,154 could halt upside movements. However, a decisive close above the latter could increase speculation that an uptrend is in progress and hit the 1,209 resistance. Alternatively, if the price manages to turn lower, the next support could come from the 38.2% Fibonacci of 1,083. Below that, the 40-day SMA could be the line to look for currently at 1,055, while steeper declines may drive the market until the 23.6% Fibonacci of 1,038. To summarize, the Google stock bias looks neutral in the medium-term, while a bullish rally above the 50.0% Fibonacci and the 200-SMA could shift the outlook to a more bullish one.